From George Kovacs comes this bronze finish flexible rail light kit with five heads that you can direct wherever the light is needed. This direct wire rail lighting system by George Kovacs includes everything you need to install a shapeable custom system. Hand-bendable rail system allows for a straight run or a curved design. Lights can be positioned anywhere along the rail. Three connectors, 4 rail sections, 8 end caps, and 11 stand-off supports are included. An elegant lighting solution that's flexible enough for any space. Takes five50 watt GU10 bulbs (not included). Sable bronze patina finish over metal construction. Etched opal glass shades. I think it will work with what I already have going in my dining room. To fill a 4' x 6' kitchen soffit. What is the style number for an extra light for K5712 (i.e. a sixth light)? BEST ANSWER: This fixture is currently not offered in a 6 light. Thanks. According to a previous message it is possible to buy another (sixth) track light head. LampsPlus has notified me that extra heads will be available toward the end of March. I will buy one when available. What dimmer goes with style 40X95 LED bulbs (used in K5712 Rail Track Kit)? BEST ANSWER: If you plan on using LED bulbs, I have added some compatible LED dimmers below you may use. Thanks. I have ordered the Lutron CtCL-153P (the slide). can these be on a dimmer switch? can I order additional heads for this track? can this be combined with the p4078-467, so that the transformer from the p4078-467 powers the entire length of the 2 sets, using the lights from the p4078-467? BEST ANSWER: Hi - No, K5712 is standard 120V and the other track and power system is low voltage. BEST ANSWER: Hi - This is sold as a complete set and there are no other light head options offered. My existing power outlet is on the wall. Can the fixture be installed on the wall or the power supply on the wall and rest of fixture on the ceiling? BEST ANSWER: Hi, unfortunately this monorail system cannot be installed on the wall. what pendant product(s) can be used with this track kit? BEST ANSWER: Hi, unfortunately, this monorail does not have compatible pendants. Are the sconces glass or plastic? BEST ANSWER: This includes etched opal glass shades. Can the power supply be set at one end, rather than in the center as shown? BEST ANSWER: The power supply can be set anywhere along the rail. Can the rail be cut? BEST ANSWER: There are three connectors, 4 rail sections, 8 end caps so you don't have to use all the rails. 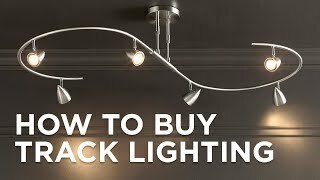 Can I mix track spots lights with pendants? BEST ANSWER: As sold, this only includes the track heads, though the manufacturer does have pendants that will fit these rails as long as you do not exceed the maximum rating of the transformer. Please consult with one of our lighting specialists to assist you in designing a system that will allow for both pendants and track heads. We have numerous companies we can work with to do this. I'm sorry but I'm not sure. The spots that come with this track actually clipped on. Perhaps it depends on if the pendants work the same way? Perhaps the company would know. Sorry. We do very much like this light fixture. Can the transformer be connected to the wall instead of the ceiling? BEST ANSWER: No, the transformer needs to be connected to the ceiling. Can the track be bent into an L shape? And where do you find additional heads? Thanks!! BEST ANSWER: The track would not be able to be directly bent into an L-shape. It would have to be curved. To order additional track heads, please call one of our lighting specialists and place your order over the phone. So it could be a curved L shape? Thanks! Yes! It is a very flexible track that can be mounted in an infinite combination of curves and straight runs. The adjustable track heads can be mounted anywhere along the track run. To bend or curve the rail, you use a kitchen tabletop of similar item as a template to bend the rail. Thank you for this info. Do you know if it also comes in a white finish? Or something similar in white? We don't have anything similar in white however, we do have a few choices available in silver with some that have white in the track heads. Click on the link below to view the selections. Can additional lights be added to the rail? BEST ANSWER: Yes, additional track heads can be added to the monorail. Thanks for the reply. Do you know how many heads can be added? how low does it hang from the ceiling ? BEST ANSWER: The hanging height is 11.5" inches. What is the total length of the rail? BEST ANSWER: The rail is 16 feet wide. I believe the specs for this item list the length as a 16 foot rail. BEST ANSWER: Yes, this fixture is dimmable using any standard dimmer. This track lighting is good looking, functional and well made. I love it. As you know by now, I have ordered a second one for my living room. Chris at lamps plus has been the only person that listened to what I needed to match existing fixtures. Other companies just said to try amazon. She did the research and found my lighting fixture. This low voltage complete track kit is easily installed and provides great lighting for almost any room in your home or office. A deep bronze finish adds warmth to this beautiful multi-directional dimmable 6-light track fixture.